"We'll see," he said. "I'm looking at that very closely. I am not happy with him." Price, for his part, has defended the travel as work related while a housing department spokeswoman has insisted the secretary flies commercial when possible. 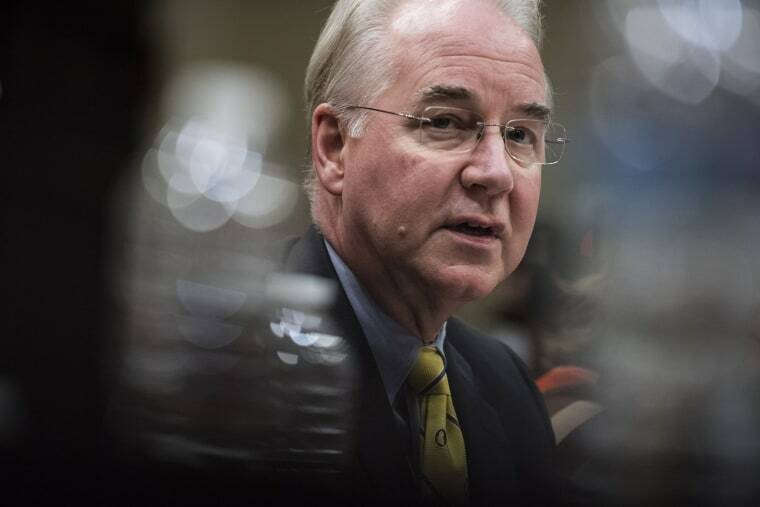 The HHS inspector general's office says it is reviewing the private flights. Trump fielded questions from reporters for about five minutes on the South Lawn of the White House. The topics ranged from criticism of National Football League players' protests during the national anthem to beleaguered Republican health care efforts and the Alabama Senate race. But until then, Trump previewed an executive order to achieve one of the few health care specifics he'd campaigned on: buying health care coverage across state lines. That order, Trump said, would be signed "probably" next week." Luther Strange, the incumbent who earned Trump's backing, "came a long way," the president said, but the runoff's winner, Roy Moore, now had the president's support. Moore, Trump said, is "going to be a great senator." The election is in December.